Bushnell Rangefinders make estimating the range to the pin quick and easy in a distance-measuring instrument that uses laser technology to calculate the distance to targeted objects. Your Bushnell Rangefinder will let you know how close you are to that bird nest -- accurately. Bushnell hunting rangefinders are perhaps the most fluid of all of Bushnell's sport optics offerings. Models seem to change yearly as new technologies arise. 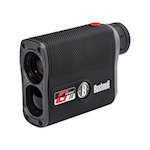 Rely on Bushnell to stay current and offer a good selection of rangefinders and price points.